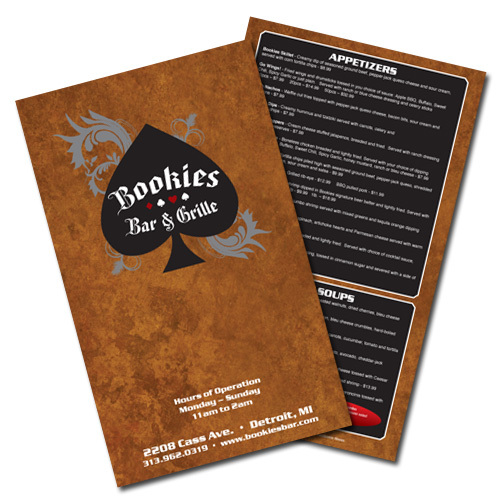 Size 12" x 18" 11" x 17" 8.5" x 14"
12x18, 11x17 or 8.5x14 Full color restaurant menus printed on 12pt C2S card stock. 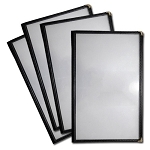 This glossy stock helps achieve rich colors and really gives any menu a professional, elegant appearance. Restaurant, bars and night clubs all over the Metro Detroit region are taking advantage of this cost effective option for their menus. The 8.5" x 14" menu is best paired with our sewn edge vinyl menu jackets for fantastic protection against moisture and wear & tear. Available in 2, 4 & 6 view. Finished Sizes: 12" x 18", 11" x 17" or 8.5" x 14"